The sky is the limit as our Wizard takes you deep into the supernova, through vortexes and into alternate universes. This intergalactic 3 reel also has the opportunity to multiply your winnings up to several times before it gets sucked back down the wormhole. For a complete list, view 2019 slots games here. Have you ever imagined what it would be like to witness a Supernova? 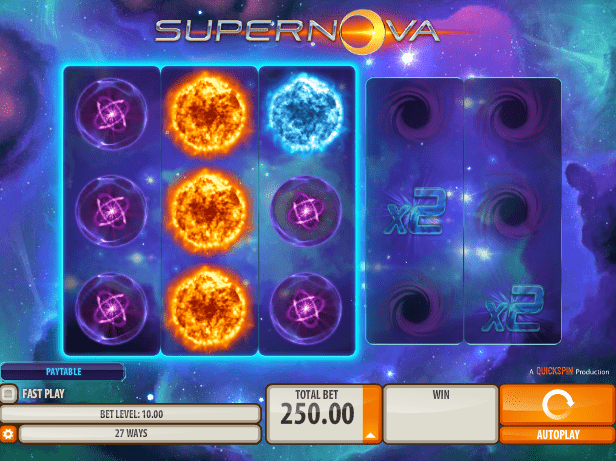 If you love space you’re going to love the theme to this online slot game, from Supernovas to Complex Light Patterns, to Wormholes, this unique game also multiplies your rewards in a bonus Multiplier Feature which will boost your takings up to several times before your bonus gets stopped by a Wormhole. It's also in the player's interest if this is the best UK slots for him. Games start at 25p and £50 per spin. You’ll notice that there is something different to this game compared to what you have seen before. On the left is your 3 reel, 27 playline offering. You’ve got 7 different symbols, 3 brightly coloured Supernovas, 3 Atom symbols and a Wild. On the right is another two set of reels made up of Wormhole symbols which may not pay anything but do offer sets of multipliers. The 3 different coloured Supernovas have different coin values, the green fireballs pay 15 coins, the blue fireballs also give you 15 and the orange fireballs give you 50. All of these wins will trigger the Multiplier Feature which is played on the reels to the right. Randomly selected before each spin, multipliers include 2x, 3x, 5x, and 10x your payout could be boosted by 100 times your payline bet! When you spin one of these reels whatever multiplier appears on the first reel will multiply your win. If a multiplier should also appear on the centre position of the second reel your win will be multiplied again! This will continue until a wormhole on either reel ends the bonus. The Multiplier Feature is Super Nova’s single feature, but it’s a good one. You can keep going with it, earning small amounts and potentially big amounts. Super Nova focuses on a single feature, which may not be a bad thing. It’s a face paced game with plenty of wins to keep you going. The space theme is simple yet beautiful, this game is full of cosmic energy. 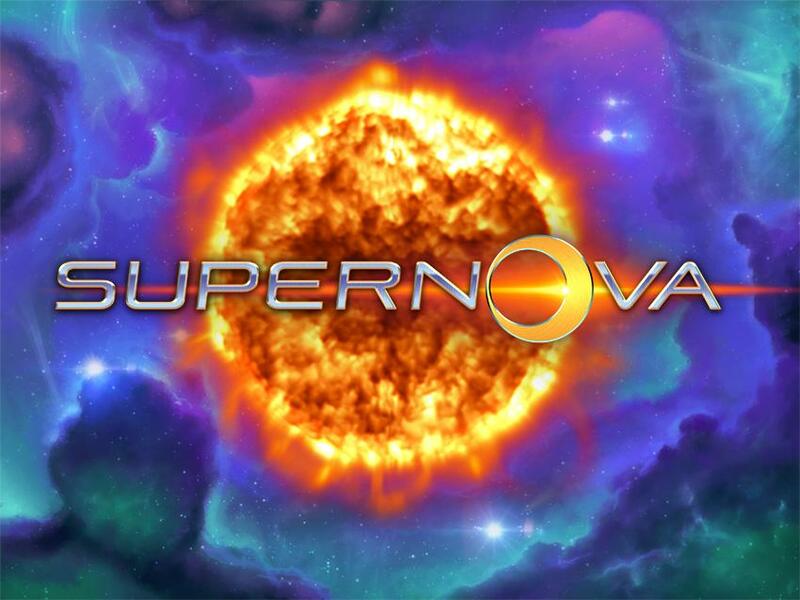 If you’re looking for a different kind of online slot game that pays prizes often, with the chance to make them bigger than Super Nova will be a good choice for you. It’s a simple 3 x 3 reel slot and unique multiplier bonus makes this game stand out from the crowd. Despite Super Nova only being a 3 reel it certainly still has the clout that most of the 5 reels think they possess. 3 reels can be looked at in two ways, nice and simple for the new gamers, or a welcome relief from the sometimes cluttered 5 reel slots that many developers seem to produce. Now, how about you feel the rush with our reel rush slot?